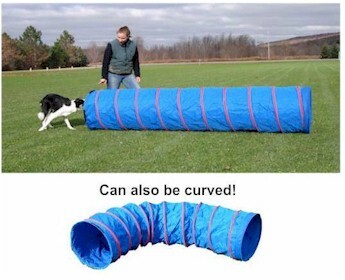 The perfect solution for an affordable, yet durable tunnel for backyard practice! Featuring a steel coil that is sewn inside the lining (nothing will catch on the dog), and like a big slinky it condenses up for easy lightweight storage. The material is made of heavyweight dacron polyester fabric. It is durable, resists the roughness of dogs claws, yet weighs only between 8-12 lbs! Color is Royal Blue with Red Stripes on the coils (except for giant size, which is solid blue). Actual tunnel lengths may vary by ± 2 inches. Optional: These cradle-style braces can be used to secure your tunnel on a hard surface, or use these handy E-Z Sacks to help hold your tunnel in place anywhere. Click Here for more Practice Tunnel FAQ's. < Don't forget to Click this Button! Email: sales@affordableagility.com We promptly return all calls & emails! All images and content copyright © 2000-2016 Affordable Agility, Inc. All Rights Reserved.